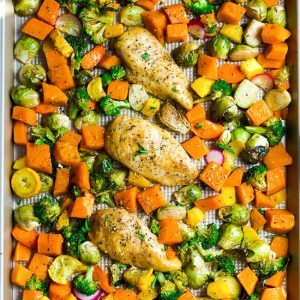 Sheet Pan Harvest Chicken with Vegetables - an easy complete one pan meal with low carb autumn vegetables perfect for fall. Made with tender and juicy with Brussels sprouts, pumpkin, broccoli and yellow zucchini. Keto, paleo, gluten free and Whole 30 compliant. In a small bowl, combine the salt, pepper, thyme, rosemary and sage. Place the chicken in a large resealable bag and add 1 tablespoon olive oil, 1 tablespoon of balsamic vinegar and half of the seasoning. Seal the bag then press to rub the oil and seasoning on the chicken. Set aside for 20 minutes or chill in the fridge for up to 24 hours. Chop your vegetables then place in a single layer on a large rimmed sheet pan lined with parchment paper or foil. Drizzle with remaining olive oil and seasoning. Nestle chicken in the middle of the pan, moving vegetables aside as needed. Place pan in preheated oven and roast for 12 minutes. Flip the chicken and toss the vegetables in pan. Return pan to oven and continue cooking for another 10 minutes, or until chicken is cooked through and internal temperature reaches 160 to 165 degrees F. You can remove the chicken to plate first if your vegetables are not done to your liking and continue cooking until the vegetables are cooked. Sprinkle with fresh parsley or rosemary and serve hot with your favorite sides.